Hi! 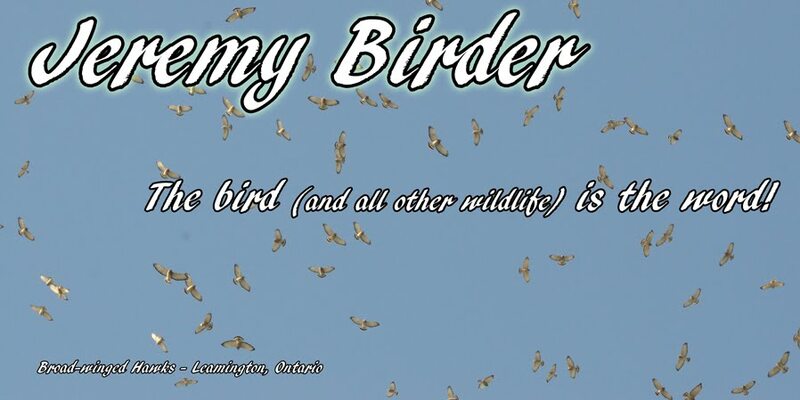 My name is Jeremy and I am an avid birder from Leamington, Essex County, Ontario. I absolutely love wildlife and spend virtually all of my time immersing myself in it. I take part in quite a few citizen science and volunteering programs, and I spend a large portion of the year doing contract field biology work for Bird Studies Canada, as well as tour guiding in the Point Pelee and Essex County area. I would love to get into guiding internationally and/or steady permanent field biology work. I am a proud member of the Vortex Field Team and absolutely love my Vortex Razor HD 8x42 Binoculars and Razor HD 85mm spotting scope. I am one of the only year-round resident birders in the Point Pelee area and I like to take full advantage of that opportunity! Wildlife was not always my 'thing,' but I did always have an interest and appreciation for the natural world. Having grown up in Leamington, Point Pelee National Park was only a ten minute drive from home, and as a child I visited it quite often with my mom, brother, and grandparents. Some of my oldest fond memories are of walks on The Boardwalk or to The Tip. We would frequently see naturalists guiding groups around and pointing out the vast diversity of wildlife like birds, flowers, insects, and trees, and I found their skills so impressive. When I was about 10 years old I went to the Holiday Beach Hawk Festival with my dad, where again I was very interested in the skills and knowledge displayed by the raptor counters and bird banders. For many years I dreamed of becoming a wildlife 'expert' so I could share the natural world with others, but I never really considered exploring any avenues to make that possible. I did not personally know anyone who was even the slightest into naturalist hobbies like bird watching, bug collecting, or botany. Instead, I had a lot of experience with playing video games, my main hobby growing up. When I was around age 21 I got an SLR camera and discovered very quickly that I cannot capture many good photos of much diversity of wildlife if I do not first learn about and appreciate that wildlife... Within a few months of getting the camera I put it back down and instead carried binoculars and a field guide, aiming to learn as much as I could about the local birds who breed in, overwinter in, or migrate through the area. I gladly gave up video games about two weeks after finding our about bird watching, and a handful of years later I have not looked back once! I feel like I was born to be a naturalist and I am grateful that I have realized this at such a young age. I've spent considerable amounts of time in many areas of Ontario over the past few years, as far north as the coast of James Bay near Moosonee, Cornwall and far Eastern Ontario, and nearly everywhere between here and those places. Fortunately my field work has taken me to hundreds of interesting wetland sites across Southern Ontario. I have done a bit of international birding, including trips to various locations across North America and a couple of weeks in England. My strong interest in understanding birds has led me into studying much other wildlife, including but not limited to insects (especially moths, butterflies, dragonflies, and bumblebees), herps (reptiles and amphibians), mammals, flowers, and trees. I regularly set up a sheet with a very bright light to attract and identify moths at night, raise butterflies like Monarchs and Black Swallowtails, study animal tracks, flip boards for snakes, and am currently developing a large naturalized garden in my yard. You name it wildlife-related and I probably either do it or am interested in trying. Happy hiking and good birding! Jeremy you are amazing. Just surfing the news and an article about you came up so checked it out. What a great ambition you have in your life. There is something fascinating and intoxicating about that moment when you sight the bird, take the picture then later see the image and it was captured beautifully. Your photos are stunning. Good luck with your count and I will be following your blog.